Meeting of the Coalition against hate speech in the Internet, formed within campaign run by the Council of Europe, has just ended in the Batory Foundation. Representatives of over 30 non governmental organizations from Poland and Ministry of Education, Ministry of Sport and Tourism, the Office of the Government Plenipotentiary for Equal Treatment shared their experience in the field of research, response and counteracting of the hate speech online and offline. The meeting was concluded by Michał Boni, the Minister of Administration and Digitisation, who expressed his support for the initiative. 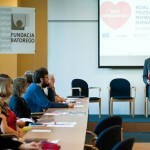 The meeting was supported by the EEA Grants within the Citizens for Democracy programme.